Interested in straightening your smile? Contrary to popular belief, you don’t need metal braces to accomplish this goal! 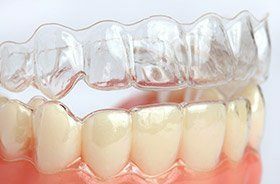 Invisalign Clear Braces are a tried-and-true, FDA-approved orthodontic system that uses a series of clear, customized aligners to gradually reposition the teeth. By using three-dimensional computer imaging, a patient’s entire treatment plan can be precisely mapped out before it even begins, ensuring success. Why Choose Torrington Dental Care for Invisalign® Clear Braces? There are no uncomfortable wires or brackets to worry about when using Invisalign aligners, and they are 100% removable, which means no food or drink items are off-limits throughout treatment. Better yet, the aligners are very subtle in appearance – most people you pass in a day will never even notice them! If you are interested in attending an Invisalign consultation, contact our dental office in Torrington, CT today.